The three largest meat processors globally have dramatically increased in size in recent years. Government subsidies have played a critical role in increasing their power. 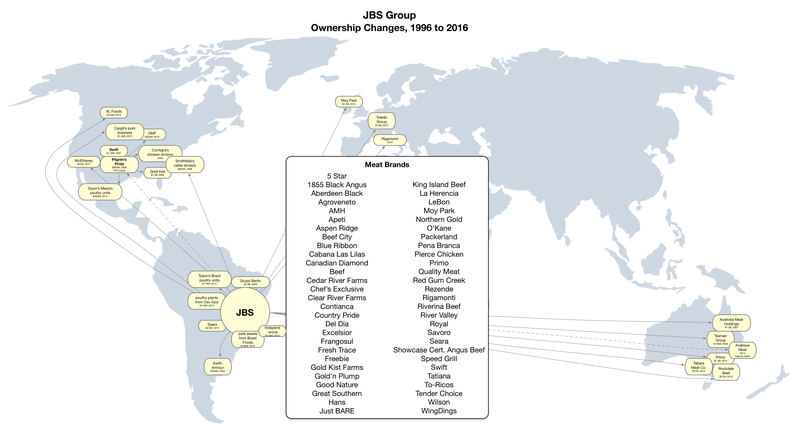 JBS, headquartered in Brazil, benefitted from partial ownership from government-owned banks, and low-interest loans to acquire competitors in other countries. The founder, José Batista Sobrinho, and five of his children are now all billionaires. A government investigation of bribes to allow the sale of tainted meat in Brazil led to two of the founder’s sons to offer testimony in exchange for immunity from prosecution in March 2017. They admitted to spending hundreds of millions of dollars bribing thousands of politicians, and said that if they hadn’t, “It wouldn’t have worked. It wouldn’t have been so fast.” The firm was ordered to pay a $3.16 billion corruption fine, and subsequently announced plans to sell billions in assets, including Five Rivers Cattle Feeding in North America and Moy Park in Europe. Similarly, the WH Group, headquartered in China, received substantial direct government subsidies, as well as low-interest loans from government banks to make foreign acquisitions. One such loan, for $4 billion to acquire the largest hog processor in the U.S. (Smithfield), was approved in just one day. The chairman and CEO of the firm, Wan Long, paid himself a $460 million bonus after this acquisition, making him a billionaire. WH Group executives have announced their intentions to spend potentially billions more to acquire more meat processors and brands, particularly in the U.S. and Europe. Tyson, headquartered in the U.S. has benefitted from subsidies for crops, such as corn and soybeans, which have saved the firm hundreds of millions per year in feed costs. The firm has also received direct payments from the government to stabilize prices, via purchasing dark meat chicken for federal food nutrition assistance programs. Its contract growers have received subsidies for the disposal of waste through the Environmental Quality Incentives Program (EQIP), and for euthanizing chickens affected by avian influenza to contain its spread. Don Tyson, the corporation’s former president and CEO, was a billionaire when he died in 2001. The timeline below shows key ownership changes involving these firms in the last two decades, although it excludes acquisitions that are more peripheral to meat processing, such as frozen pizza firms. The treemap below shows the scale of the largest deals (those of $350 million or more) during this period. Both the size of the largest deals and the time that they occurred are visualized in the streamgraph below. It shows that all three firms have spent significant amounts on acquisitions in just the last five years. These three meat processors are also the largest in the United States. Cargill is the only other U.S.-headquartered firm among the top ten meat processors globally, and it is ranked #3 in beef in the U.S. with a 19% share. This privately held firm sold its pork division to JBS, however, in 2015. For more information see: Howard, Philip H. 2017. Corporate concentration in global meat processing: the role of government subsidies. Working paper, Department of Community Sustainability, Michigan State University. September (pdf version).